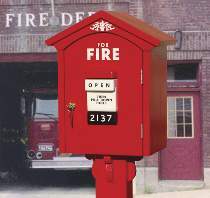 Fire alarm boxes have been a fixture along the streets of New York and other eastern cities for over a century. These antique fire warning symbols are cherished by collectors but are priced out of range for most of us. Why not build your own? Locking door holds garden tools, fire extinguisher, etc. The “pull down” door lever is stationary - for decoration only. Fire Alarm Box measures 15-1/2"H x 13"W x 9"D. Order decal, hinges and lock with keys separately or see Fire Alarm Box Special which includes Fire Alarm Box Plan, Fire Alarm Box Decal, Hinges and Lock With Keys.